Into The Deep: We have been called! No one said Lent would be easy. In the early part of the last century, one of the great witnesses to the faith was a Carmelite nun, Sister Teresa Benedicta of the Cross. Most of us know her as Edith Stein. She was born to a German Jewish family in 1891…became an atheist…but was baptized a Catholic in 1922. Eleven years later, she entered the cloister. And in 1942, she lost her life at Auschwitz. Today she is recognized as a saint. God asked her to go forth, just as He did with Abram, and she responded – venturing into to a world she never foresaw, meeting a fate she never imagined. But her devotion and her trust were complete. In the early 1930s, she gave a lecture and spoke of what it takes to be a Christian. Well, that puts in perspective the idea of giving up chocolate or ice cream for Lent, doesn’t it? And it illuminates, with a blinding clarity, what we are all called to do: it is nothing less than to walk the way of the cross. We come to understand why in today’s Gospel, where we are told of yet another journey– up a mountain — where Jesus is miraculously transfigured. Here is a breathtaking glimpse of Jesus-as-God – a beautiful and humbling foreshadowing of heaven. This is what all our journeying is about. And so He speaks to us, wherever we are on our journey. Rise, and do not be afraid. 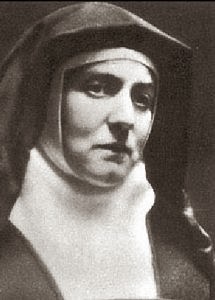 We have been called, just like Abram, just like St. Teresa Benedicta of the Cross. Just like the countless others across the ages who have been called, following a path laid before them…trusting, faithfully trusting, that God would take them where they were meant to go. Some of them were saints. But all were sinners, just like us – walking their own way of the cross. Rise and do not be afraid. They are words to encourage us on our Lenten journey. Yes, there will be setbacks and stumbles. We will make mistakes. We may even grow lazy or indifferent. We will be frustrated and embarrassed by our humanity, and our weakness. There are minefields waiting for us – including Ben and Jerry. But that, too, is part of our journey. We should never forget why we are following this path, and making these sacrifices, and trying to turn our hearts back to God. We strive toward a paradise we can’t begin to imagine, where Christ dwells in light, and in love, transfigured forever. And we aren’t alone – in Lent, or in life. He is waiting for us, hoping for us, praying for us. So rise. And do not be afraid.